Fight Chaos with... more Chaos! Battle your hardest, Hero, because it ALL depends on you... and if you fall, so does Lore! Things have been too quiet for Drakath, Champion of Chaos, so he's loosed his Chaos minions across Lore with instructions to destroy - or save - as many townspeople as possible. If you CAN defeat his High Chaos Knight, you will receive a Chaotic reward which may save your life... and the world! Talk to King Alteon or Empress Gravelyn when you /join chaoswar to watch the opening cutscene (click the Drakath Attacks?! button) and see just what Drakath and the Twinions (twin minions, right?) are up to this time! This War Seems Different... CHAOTIC!! Chaos plays with your mind; don't trust what you see! Except in this case, because the war IS different! You have the regular war meter and then a PERSONAL war meter! For every 50 monsters you kill, you defeat 1 war wave. Each wave you defeat raises the top war meter. Buying the Medallion of Order from the Lore's Defender shop for 500 ACs means that you will only need to kill 25 monsters to complete a wave! The Chaos Destroyer shop unlocks once you've hit 100% on your personal war meter! Big fan of Chaos? Not a fan of Chaos at all? Then we've got the loot for you! Battle through the waves of the Cross-Lore Chaos War (/join chaoswar) to access the following shops! 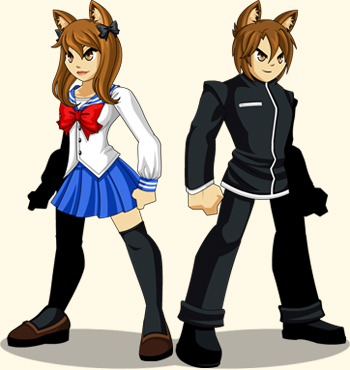 Note: ALL of the war content except for the rares items in the Lore's Defender shop will stay in-game permanenty! Medallion of Order: use to cut the number of war turn-ins you need in half! Chaos War Merge - in-game forever! Chaos 100% Shop: Unlocks at the end of the war! 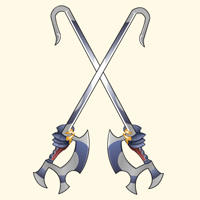 This blade WILL change form as the final Chaos battle nears. You can buy an AC or Member version of the Chaorrupter Locked blade from the Lore's Defender shop to use during the war, OR you can get it as a non-member, gold drop off of the boss monster at the end. 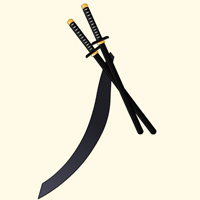 The AC and Member versions of the blade do double the damage the non-member version does! 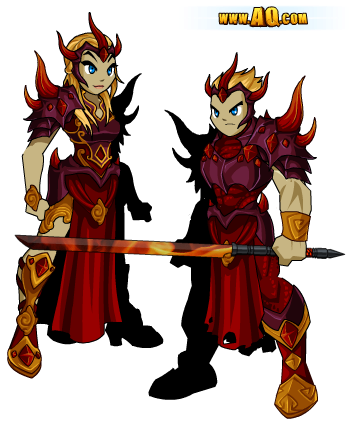 Battle Chaos in the Golden Fury armor when you buy a 12 month upgrade! Captain Rhubarb's 10th Anniversary Shop! Slay the Ninja Nopperabo in the /hachiko map until you get "Rhubarb's Reward" note. That will let you unlock the Captain's 10th Anniversary shop! Head to the Necropolis to get your very own battle companion! Bring Daimyo with you as you adventure through Lore! 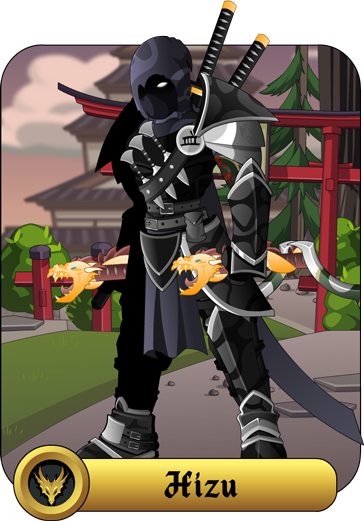 Daimyo is ONLY available while his birthday shop is in-game, but once the shop leaves, you'll be able to merge your pet into the Armored, Dark Armored, or Chaos Daimyo versions! Hooray! It’s Friday! And you know what that means: a brand-new release in your favorite online adventure game! 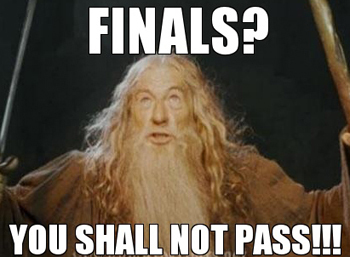 So who is ready for a chaotic weekend full of quests and adventure? Who is ready to save the world from the forces of Chaos? And who is ready for a sneak peek at all the AWESOME items arriving tonight?! Woah woah WOAAAH! Alright alright, here they come! Oh man. I dig these Chaos looks. Since purple is pretty close to pink… does that make me pretty close to being Chaotic? All these items—and more!—can be obtained during tonight’s release. Stay tuned for more updates! The Golden Fury is Here! Legend foretells all that glitters is gold… but the Golden Fury Armor Set has that beat tenfold! Inspired by Norse Mythology, the Golden Fury Armor Set pays homage to Odin, ruler of Asgard. 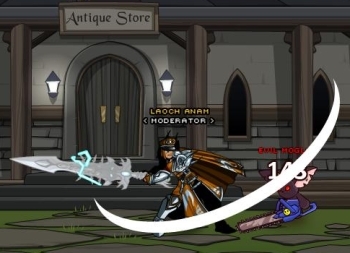 Ragnar of Battleon and his fellow Asgardians bow to the might of the Golden Fury, recognizing its great power and detailed craftsmanship. Everyone likes to save money. And everyone loves a good deal. And when you purchase your 12 Month Membership package, you’re getting a GREAT deal AND saving the MOST money! Dude. I spend MORE than that on my Frappichinos. Everyday. Why can’t Starbucks offer a sweet membership deal like AQWorlds? Will YOU Drive Back the Chaos Attacks? Slay the Chaorrupted creatures invading the cities and towns across Lore... before they cause so much Chaos there's no Lore left to defend! Things have been too quiet for Drakath, Champion of Chaos, so he loosed his Chaos minions and they're free to play games with your mind... and wreak havoc on your world! 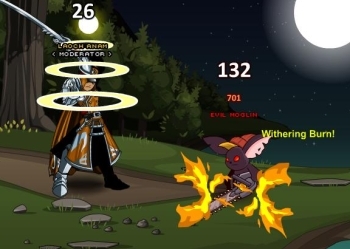 Drakath directs the Chaos attacks! Chaos War: Expect the Unexpected! Chaos isn't just "purple evil," and Drakath wants to make sure you and everyone else in Lore know it! Chaos can hurt... or it can help; it can harm or it can heal. THAT is the true nature of Chaos... unpredictability. Attacks by Chaorrupted skeletons are NOT humerus. You, Hero, have grown to used to set patterns, and it's time that changed! 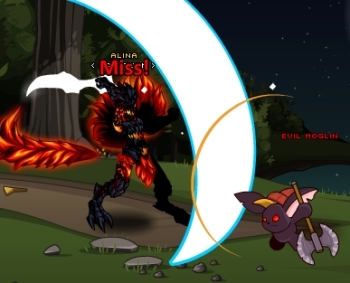 As Drakath's monsters spread across Lore, rumors are spreading that some Chaorrupted creatures are attacking, while OTHERS are defending. NOTHING bad happens to kids in red shirts riding wolves! Chaos wolves are playing with children while Chaorrupted bears fight off invaders. Chaos chickens lay mountains of wholesome Chaorrupted Eggs for farm-wives to scramble. Sp-Eyes play peek-a-boo with city children. 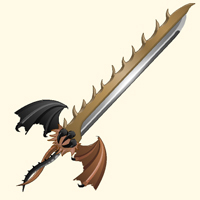 And to make sure you NEVER rely on the things you encounter when facing Chaos monsters, Drakath instructed his war boss to reward you with the Chaorrupter Blade*, which deals EXTRA DAMAGE to Chaos creatures, if you defeat him! I'd wish you Good Knight, but these were Chaorrupted. Free-player version drops from the boss monster! 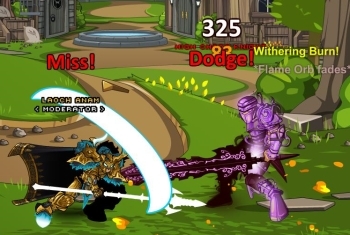 When the final confrontation against Drakath comes, having the weapon WILL change how your battle against him works! 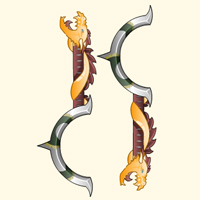 If you don't want to take a chance on wielding Chaorrupted weaponry, talk to King Alteon or Empress Gravelyn in the Chaoswar map to buy the Medallion of Order for 500 AdventureCoins! Chaorrupted Gorillaphants go ape for heroes to slay! With the Medallion in your inventory, your war meter will raise twice as fast, because this magical medallion cuts the number of Chaorrupted creatures you need to kill by 50%! 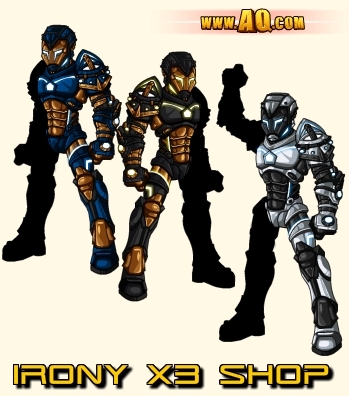 Tomorrow: previews of the Golden Fury armor set which comes with the 12 Month Membership package! Magical Items and Magical Birthday Wishes! Starting at 5pm EST today, Jemini’s shop will be full of AMAZING “Magical Anime” items to quench your anime thirst. Cat ears, costumes, alpacas, and sparkles await! Sorry J6, but Jemini is my favorite Time Traveling Kleptomanic EVAR! Jemini has traversed space and time, collecting awesome artifacts and adorable loot. Throughout her travels, Jemini picked up a message from Korin and landed her spaceship, The Yaris, at the Secret Underground Lab in February 2008. Jemini has always loved drawing. Disney played a major roll in helping her develop her skills at a young level. And once Jemini found the wonderful world of Anime—especially Sailor Moon!—she really got into drawing people and portraits. Jemini has contributed her art style to almost every Artix game at one point or another. 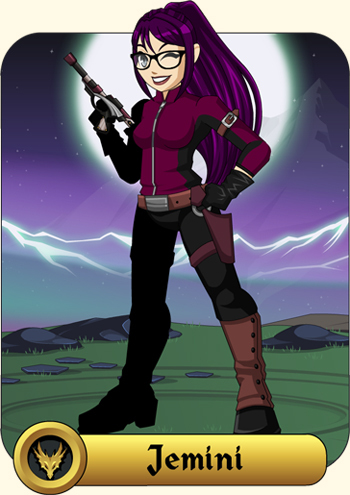 And now this week’s AQW Featured Artist Shop is dedicated just to her! Jemini can't help herself—she loves Magical Girl anime. She feels like if anyone could deliver this theme to AQW, it would be her! Oh. My. Goodness! 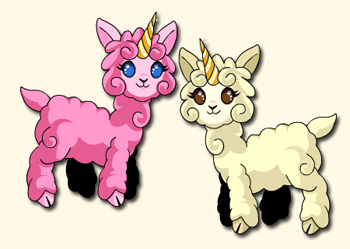 Jemini’s Alpaca Pets are magically adorable! But what’s the story behind Jemini’s Alpaca-infatuation? A few weeks ago, Jemini took a trip to a local alpaca farm called Golden Spirit Alpaca Ranch. Nestled on 75 acres and home to over 160 Alpacas, Golden Spirit Alpaca Ranch was the perfect place for Jemini to play with…erm, do “research” on… alpacas! 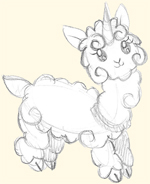 Jemini LOVED her trip to Golden Spirit Alpaca Ranch and just HAD to create an in-game Alpaca Pet for AdventureQuest Worlds. Now that you can have your very own Alpaca, here are some fun facts about Jemini’s favorite furry friends! Alpacas have only one row of teeth—derp! 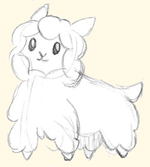 Alpacas are quiet docile animals, like Moglins! 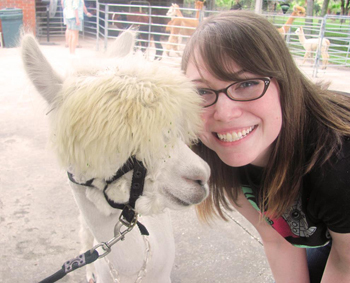 If you are in the Tampa Bay area and would like to visit a real-life Alpaca ranch, make an appointment with the super friendly Golden Spirit Alpaca Ranch family! But if you’re too far from Florida, you can always get an Alpaca Pet inside AQWorlds right at your fingertips. Let’s make this Tuesday the most magical one ever whooohooo! Give Jemini much love and many birthday wishes on her Twitter! And then get your Anime On in Battleon! Starting at 5pm Server Time! Battle to Build the Blade of Awe! Quest throughout Lore to gather the pieces of the Blade of Awe! Every Hero in a fantasy game needs a weapon strong enough to save the world, and the enhancements attached to this blade will make sure no villain can withstand your might! /Join Museum and talk to Valencia to head to the Crossroads. There you can begin the quest for the Blade of Awe! After you find each piece, make sure to head to the 2nd floor of the Museum, because you'll see the pieces of the Blade of Awe appear as you gather them! How do I get the Evolved Weapons of Awe?! These quests will take Members on a journey through Lore battling the toughest beasts in the game! How do I get the Guardian Blade of Awe?! 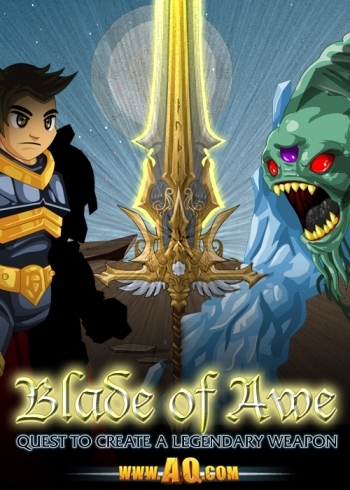 Merge with the BoA to create the Guardian's Blade of Awe! Merge the Prime Blade of Awe into the Guardian's Prime Blade of Awe! * The gem in the center will change to red before release. 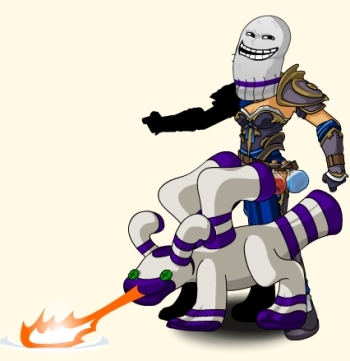 ** The Armored Guardian Dragon Battle Pet says snarky comments as it attacks! Do Guardians get any other advantage? Yes! Since the original Blade of Awe was crafted in AdventureQuest, we want to thank its supporters. The Guardian Stonewrit will be added to the Verification shop! 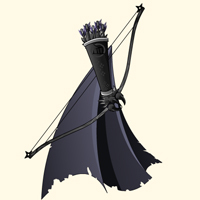 Merge this in the Stonewrit Merge Shop and turn it in to complete the first quest for the Blade of Awe! Create the Blade of Awe to unlock the Enhancements of Awe! These can be equipped on ANY weapon in your inventory (but we suggest trying them out with the Blade you've battled so hard to create). These enhancements add new attacks to your weapon, but the specials will not happen every time you attack. Enhancements are available at levels 1,10,20,30,40, and 50. Level 40 and 50 Enhancements are Member-only. 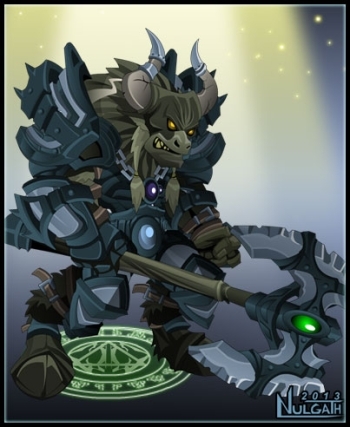 The Minotaur Maurader armor, helms, and weapons are now in Nulgath's Featured Artist Limited Time Shop! Go Minotaur against Minotaur when you battle Graveclaw! Log in any time until 12AM EST (midnight server time) Tuesday, May 28th, on ANY server to enjoy the DOUBLE XP BOOST weekend! Get DOUBLE experience points from any battle or quest... and if you're a Member, get 10% more REPUTATION when you play on Sir Ver or Evil Sir Ver! These boosts stack with the AC XP and Rep Boosts available in the Class Shop in Battleon, so if you needed help leveling up, this is the weekend to play! We will be doing more boosts in the future, too! Some of them smaller, some of them different. We can cycle between gold, exp, rep, or rank boosts! Member servers will always get MORE boosts than whatever is being offered on other servers. Live: 5 More Buyable Inventory Slots! Feel like your backpack is a little cramped? Is your bank full to overflowing? We have heard your cries of pain in the game, on Twitter and Facebook, and on the forums! Well, get ready for GREAT news, because we JUST added 5 MORE buyable inventory slots for 200 ACs each to AQWorlds! 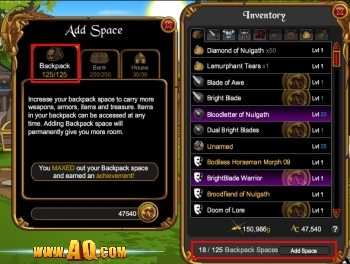 AQW Inventories: now with more space! Tuesday is here—and that means an all-new Featured Artist Showcase Shop has arrived! If you couldn’t tell by my glaringly obvious Design Notes title, this week is dedicated to everyone’s favorite Archfiend of Oversoul, Nulgath! As the mortal enemy of Dage the Evil, Nulgath has unleashed his own collection of ALL-RARE killer armors, weapons, capes, and more to show Dage where the REAL artistic talent lies. * Includes a quest to farm Diamonds/Uni 13s/weapon. All of the items in Nulgath’s Artist Showcase Shop will go permanently rare—they will NEVER be offered again—so if you wanna own a piece of history (or like 27), you better stock up today! As the former Master to Dage the Evil, Nulgath is the General of the Great Abyss, looming over the battle-hungry souls of OverSoul. 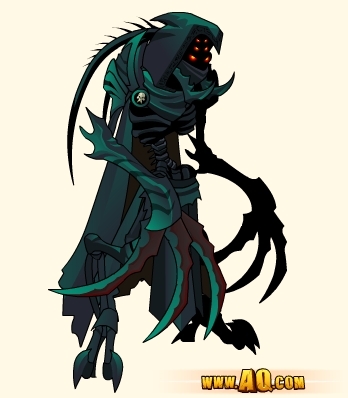 Nulgath has appeared in many forms under many names, but his current evolution is quite pleasing to him …even if his appearance does strike fear into all those who gaze upon him! Outside AQWorlds and OverSoul, Nulgath’s real-world artistic inspirations stemmed from Conan the Barbarian book covers and fantasy art at an early age/level. 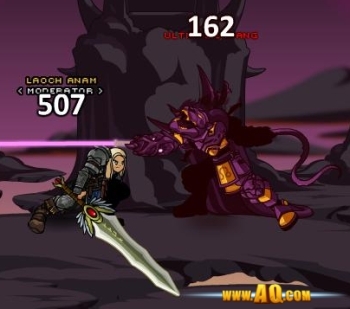 Back then, Nulgath was known as “Miltonius” and was contacted by Artix about doing a short film for DragonFable. That movie, Artix vs. The Undead, is AMAZING and incredibly popular and ZOMG if you haven’t seen it you NEED to right now! Feed Nulgath’s self-esteem by giving him a shout-out on his Twitter! And now, get your Gear On in Battleon’s Featured Artist Shop! Find the Pieces to Build this Legendary Weapon! Quest throughout Lore this Friday, defeating the toughest monsters and roughest bosses to gather the pieces of Blade of Awe! 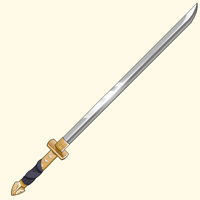 Every Hero in a fantasy game needs a weapon strong enough to save the world, and the enhancements attached to this blade will make sure no villain can withstand your might! Create the most powerful blade ever! * The Armored Guardian Dragon Battle Pet says snarky comments as it attacks! ** These Enhancements will have special effects (like the Spitfire Enh) to make your attacks more awesome! AND you can apply them to ANY weapon! How do I get the Blade of Awe?! You will need to quest to find each hard-to-find piece of the Blade of Awe before you can put it together. Slay undead to find the Hilt of Awe! How do I get the Staff, Dagger, and Spear of Awe?! Slay Dragons to find the Stonewrit of Awe! Face the Chaos Lords to find the Runes of Awe! If you are a Guardian in the original AdventureQuest AND have verified your Guardian account, then you can find the Guardian Patent resource in the AQ Verification shop! Once you've created the Blade of Awe, merge it with the Patent to create the Guardian Blade of Awe! 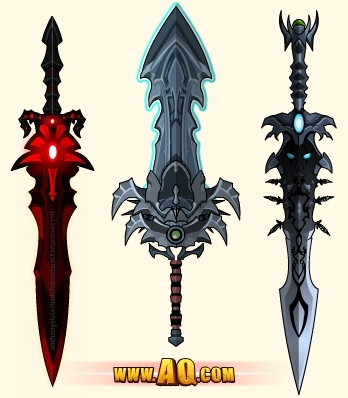 Slay challenge bosses to evolve the Blade of Awe! 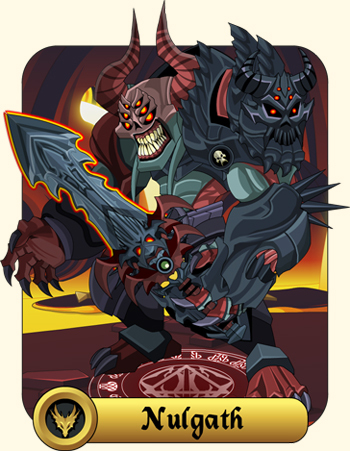 Nulgath Stars in This Week's Featured Artist Shop! 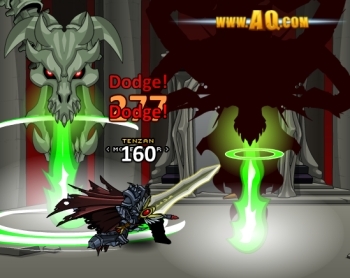 Followers of Nulgath, fall in! (If you love awesome art, you should read on, too!) The wait is over, as Nulgath's artwork returns to AQWorlds! He sent over a CRAZY amount of his Oversoul art for us to put together an insanely-awesome Featured Artist shop... and included 60 (SIXTY!) OS characters for us to use as monsters in future releases. /cheer! Wait... What's a Featured Artist Shop?! 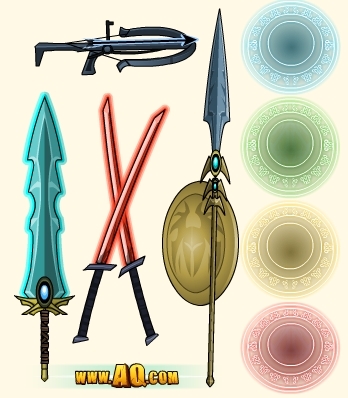 Every Tuesday, AQWorlds releases a special Featured Artist Showcase Shop loaded with items made by one of AQW's artists using their own style and flair. Our wonderful artists unleash their creativity to make some truly amazing armors, weapons, helms, and other items just for you! But these items are only available for a limited time, so get the gear while they're still here! ArchFiend's Art for his Favorite Followers! You never know what the ArchFiend will summon from the depths of his dark pool of creativity... and we sure didn't expect THIS! ALL the items in Nulgath's Featured Artist Limited Time Shop WILL go rare! Bask in the glory of the gear! Tonight: Battle Alongside Dage the Good! Journey to Brightfall to help Mirror Drakath, the Champion of Order, before tonight's release! 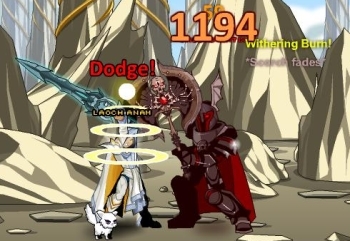 Because THIS week you'll need to help Dage the Good in the Overworld! He needs you to FREE the souls*... and then he'll help you reach the strange, celestial egg that is the key to saving Lore's future and YOUR life! In the Mirror Realm, King Alteon is your enemy. And be warned, while THIS is the final release in the Mirror Realm 2-part arc, you aren't done with Xing and Xang's storyline... because THEY aren't done causing Chaos for YOU! * Dage the Evil, in our realm, would NEVER approve! Final Update to Quibble Coinbiter's Shop! 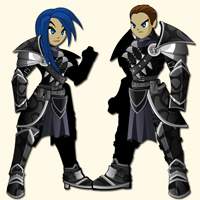 Tonight's release is the final update to Quibble Coinbiter's Mirror Realm shop! 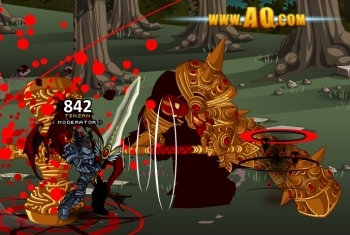 Don't miss the Doom of Lore, Cleric of Nulgath, and Mirror Caladbolg Blade! Lore's Doom is upon you (literally)! In the Mirror Realm, Artix is undead! Destiny Kitten approves of your battle skils. NEW gear in the Treasure Map! X marks the spot, TreasureHunters! Grab the Treasure Map from the shop in your game menu (or talk to Valencia or Cleric Joy) for 2,000 ACs, then decipher the clue and hunt through AQWorlds to find the Treasure Map's hidden location. If you have the Treasure Map in your inventory, when you mouse your cursor over the spot where the shop's hidden, you'll be able to open it... and receive ALL the gear we've ever added to the shop! Find the BrightBlade Warrior with the Treasure Map! Read the Treasure Map design notes for more details on how this hunt works. Just remember: ALL the gear in the shop is 0 ACs for free storage, and you'll be able to unlock ALL future Treasure Map updates for free... as long as you keep the Treasure Map! ** His momma said knock you out! Tuesday: Nulgath Featured Artist Shop arrives! This Tuesday, May 21st, the Mother's Day, Missing Sock, and Cinco de Mayo 2013 shops and Nulgath's Artist shop arrives! See all the previews and prices for his shop here! 28 Hours of Game Boosts AND 50,000 Gold! Got game (boosters)? Now you do! Earlier today we released the Game Booster AC Add-on for the 2,000 AC, 5,000 AC, and 12,000 AC packages. When you select any of these packages on the in-game payment or website payment pages, you'll have the option to add the Game Booster package for $5 dollars! In the spirit of The Mirror Realm - Part 2 coming this Friday, we should all have a little fun and unleash some creative insanity! Who would your Mirror-self be? And who else would be interesting to meet in the Mirror Realm? In the Mirror Realm... Tony Stark is a robot who created a suit of skin to battle humans. The new movie "SkinMan 3" is playing in Mirror Realm Theaters now. In the Mirror Realm... you must be over 18 to watch Disney Movies. 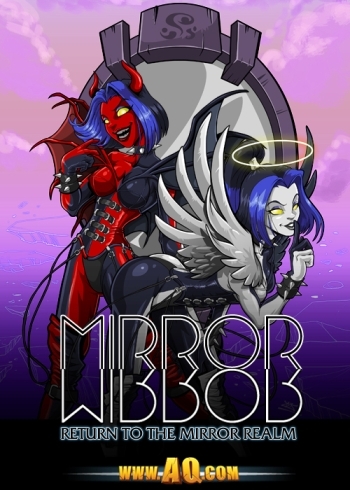 In the Mirror Realm... video game developers pay you to play their game. In the Mirror Realm... Ghandi was the best boxer, wrestler and mixed martial artist. 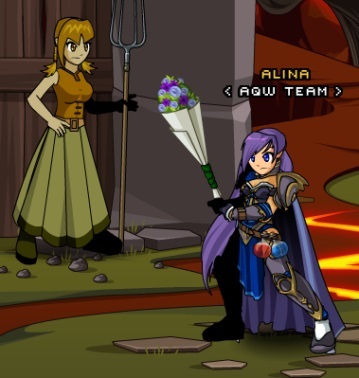 In the Mirror Realm... you send death threats on Valentines Day. In the Mirror Realm... everyone loves working over time, homework, and visiting the in-laws. In the Mirror Realm... people in other countries drive on the correct side of the road. In the Mirror Realm... Cows create chocolate milk. You have to add Vanilla to create normal milk. In the Mirror Realm... Abercrombie & Fitch only make XL & XXL clothing. Begin your Prowl as a Werejaguar! Tuesday is here—and you know what that means: an all-new Limited Time Featured Artist Showcase Shop has arrived! 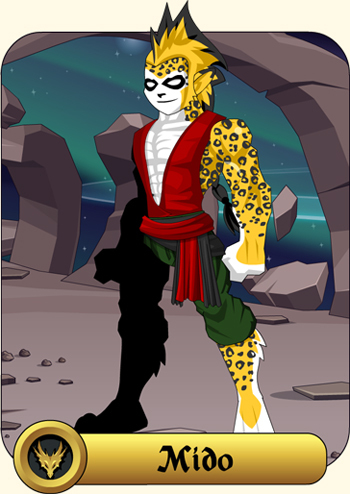 This week is dedicated to Mido, local Werejaguar and graphic designer for AdventureQuest Worlds. Mido has just released a ferocious fury of Werejaguar-themed items passed down from his ancient ancestral kin. Artix Entertainment is an equal opportunity employer. We hire all sorts of talent from Bounty Hunters to Mad Weaponsmiths to even… Coffee-Wielding Werejaguars! Mido, former barista and full-time graphic designer, first caught wind of Artix Entertainment when his classmate was playing MechQuest... instead of studying for finals! After Mido finished school with a Master of Fine Arts in Illustration and a Masters of Arts in Graphic Design, he began his prowl for internships within the video game industry. When he discovered that the local indie gaming company was the same one that produced MechQuest… POUNCE! Mido snagged the internship in April 2010 and became a full-time graphic designer three months later. Mido’s artistic inspiration comes from years of “studying” video games, cartoons, and comic books. Now all that hard “work” is paying off! Mido enjoys collaborating with a diverse group of people who all share a passion of working hard and playing harder. Give Mido a roar of approval on his Twitter! Now, get your Jaguar On in Battleon’s Featured Artist Showcase Shop! Return to the Mirror Realm to Save Yourself! Last week, the Champion of Order in the Mirror Realm, Mirror Drakath, contacted you with grave news: because you have no reflection in the Mirror Realm, the Universe has been thrown out of balance, and the cracks are only spreading. What does that mean? You know what's not balanced? Two Evil Twins in one realm. If you don't correct the imbalance, YOU will be erased from the multiverse. It's the standard self-protection sequence most universes enact. Not so fun when you're the one being obliterated, though! Journey to the Mirror Realm with Drakath to discover what you can do to restore balance, and HURRY! You know Xing and Xang are never far when a good opportunity to cause Chaos presents itself! Balance the Universe, or be Erased... Forever! You've journeyed into the Underworld already, but this week in the conclusion to our 2-part Mirror Realm adventure,* you'll need to find Dage the Good in the Overworld! He'll help you reach the strange, celestial egg that is the key to saving your future... and your life! You like your strange, celestial eggs burnt to a crisp, right? There's nothing more Chaotic than pure, random chance, and nothing embodies that more than risking everything on an unsure gamble. You'll need to decide whether or not to strike a deal with one of the most influential people in BOTH realms... or your luck - and your life - will run out! * THIS arc of the Xing/Xang storyline is over, but you know the Twins... you aren't done with them until they are done with you! The next time you'll see them, they'll have a Chaos Beast ready to face you! What do you mean Grimskull is REAL!?!?!?!?! We thought he was just a legend, a fairy tale, a campfire story. There is NO WAY he can be real! If even one sentence of the stories about him are true... then no one would ever survive even a few steps into his dungeons. You know the stories right? Grimskull is the master of the world's most evil, vile, death trap filled dugeons. No one would be foolish enough to even consider entering one of his dungeons if they did. I refuse to believe it is possible to build traps like the ones in the stories about him... and, well, do you REALLY believe the world's most powerful weapon lies at the end? A weapon so powerful that it makes the Blade of Awe, DoomBlade, and the Blinding Light of Destiny look like foam padded twigs in comparison? Only the crazy, super crazy, and ultra-mega-insano-crazy would step foot in a Grimskull dungeon. Adventurer, consider theyself warned. In the Mirror Realm, the Gear Wears You! Shed some light on this battle! Every Tuesday, AQWorlds releases a limited-time Featured Artist Showcase Shop loaded with items that an Artix Entertainment artist creates. Using his or her own style and flair, our wonderful artists create truly amazing Armors, Weapons, Helms, and other Items just for you! But these items are only available for 1 week, replaced the following week by another artist’s items. Stay tuned for his Design Notes spotlight tomorrow! Mother's Day 2013 Shop Still Open! Choose the right gift for the occasion... or battlefield. Then Prepare to Hunt for the Treasure Map Shop! 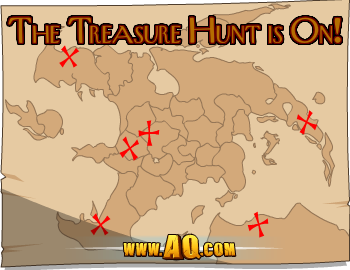 X marks the spot, TreasureHunters! We've been including new ways for you to explore the game, hunts and wars to get you back to maps you have never seen, or haven't been to in a long time. 2 months ago, we released a NEW way to do that: the Treasure Map Shop! 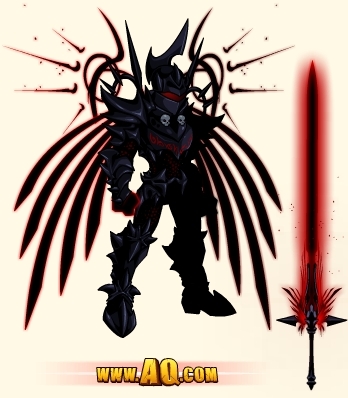 This Friday, the shop receives a set of NEW gear from Solrac: the BrightBlade Warrior! An unsullied concept sketch from Solrac! Purchasing the Treasure Map unlocks the shop forever (as long as you have it in your inventory) and the shop will be updated regularly! You only need to buy the map once AND keep it to access all future shop updates! So... What will be in the Shop? 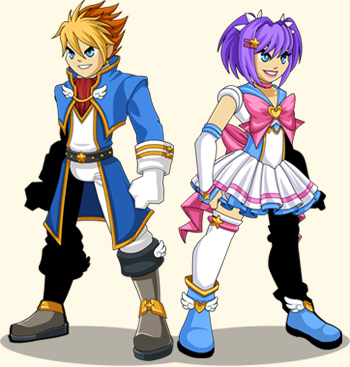 The NEW gear coming to the Treasure Map shop will be the BrightBlade Warrior set (pictured above)! Returning gear will be the Shadow Commander, Nameless Warrior, and Dragon Priest sets! To All the Moms Out There, Thank You! Every Hero's story starts with their mother. * So today's the day to celebrate whatever woman (bio-mom, step-mom, aunt, grandma, teacher or neighbor-lady) gives you the advice, reality checks, and hugs you need. 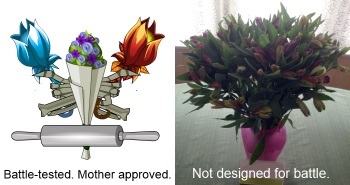 Battle Bouquets, Bone-Quets, and Dragon Flatteners! I want to send a huge thanks to my mom, who put up with a LOT while I was growing up! Always singing where I shouldn't, making up horrible, pun-filled poetry when I shouldn't, and forcing her to try strange (...often VERY strange) concoctions I made from random things in the kitchen. ** I wouldn't be where I am today without her battle strategies for facing life's toughest boss challenges head-on and blade-first! ** A true story, and early indications that I would grow up to be an alchemist. And Thanks to Your Mom, Too! Yes, yours. Go on, tell her I said "thank you!" I'll wait. You're back? Good! We couldn't keep making AQWorlds if she stopped letting you play. So whether you love your mother, ARE a mother, or just appreciate what moms do for their kids... Happy Mother's Day! ...or do you see a doorway to another world? There's no telling what you'll find behind the mirror! The Mirror Realm is a backwards world where everything is flipped in SOME way but not every way. It could be a simple as someone being right handed there where they are left handed in our world, or it could be a significant as a kindly and noble king on this side being reflected as the absolute power for evil on the other side. 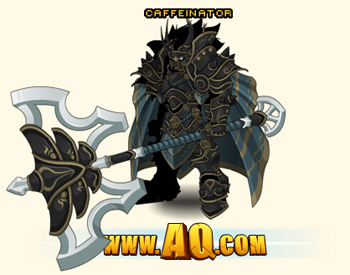 Find the GroundForce set in Quibble's shop tonight! 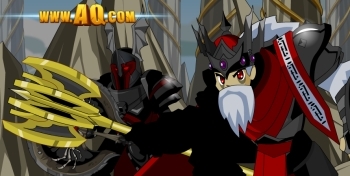 Mirror Drakath has been chosen as the Champion of Order and has been gathering his powerful Lords of order to help him bring order to a world torn in hand by a war between good and evil. 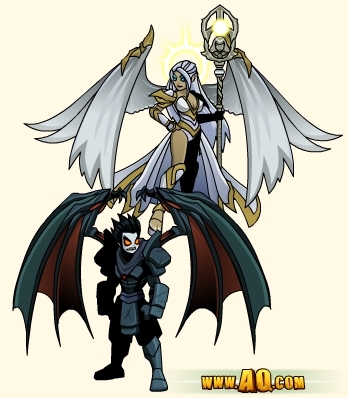 Just like Drakath in this world, he is unimaginably powerful but even as powerful as the Drakaths are... there is one to balance the other one. You are unique. There is no version of you in the Mirror Realm. As your great actions in this reality have begun to change the story the multiverse has become unbalanced without an opposite power changing the world in the Mirror Realm and that is VERY dangerous. Mirror Moglins want to HURT you, not HEAL you! Like your own natural defenses attacking an invading virus causing imbalance in the body, the multiverse has begun to react to the imbalance caused by you. Mirror Drakath has begun to sense movement in the multiverse and he has come to this side to help you escape the fate of being erased from reality. 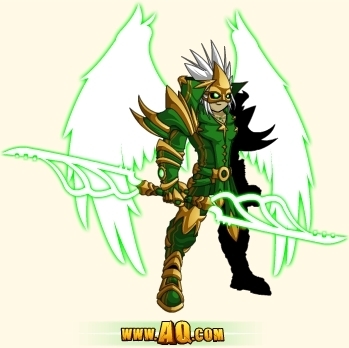 Find the MagmaClaw set in Quibble's shop tonight! You will also be able to unlock a merge shop at the end of this week's quests that will allow you to farm for a full set based on Solrac's original Omega Death Dealer called the Life Taker. We will be adding more Mirror Realm Theme items to this merge shop next week. A lot, we've had a release every day this week. The Sock Hunt will continue through the weekend. Find a sock in the game and click on it to open up a special shop. MOTHER'S DAY is Sunday and we will be adding the seasonal Mother's Day Shop to the Dragon Menu. Remember to tell your Mom how much you appreciate all that she does for you! Helping the golem put a sock in it. Command the Skies with a 1 Month Upgrade! Death from above comes from YOUR hands! Kanataka Warriors are an elite fighting force patrolling the skies over Yokai Island. Unlock the Kanataka Warrior set with a 1 Month Membership; find it inside the payment window in-game (click the "Get Membership" or "Get ACs" button on your Dragon Menu, then look for the Specials tab) or on the Portal Site. Who are the Kanataka Warriors? The sons and daughters of Yokai nobles are chosen at a young age and train for the rest of their lives to hone their battle skills. They are prepared to slay any enemy (or sacrifice their own lives) in order to protect the lives and liberty of the people who depend on them. Inspired by the hawks which soar over Yokai Island, Tyronius crafted a set celebrating the Yokai's most sky-worthy warriors! The Mirror Realm is Calling You Back. Many of you were not here for the 2010 AQW Birthday Event, hosted by Paul and Storm with special musical guest Jonathan Coulton (which was amazing). You can read a little bit about the fun we had HERE and you will also be able to re-watch the cutscenes from the event in the new Mirror Realm event starting TOMORROW! Before you cross over to the crazy backwards town of Battleoff (where Aria is a butcher, Warlic is a dim-witted scientist and Alina is a short-tempered poison mistress... and a blonde) there are some things that you need to know. 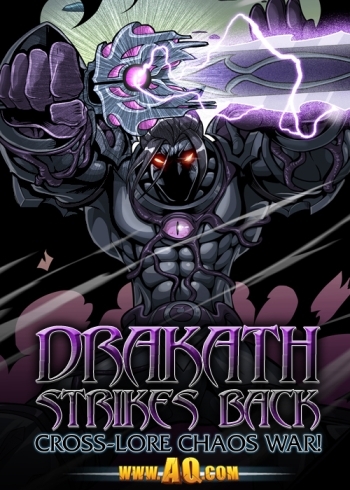 In this strange reflection of our own existence Drakath is gathering the Lords of Order to help him fight the powerful darkness sweeping across the land. Gravelyn The Good leads the Lightscythe army from her palace in Brightfall, while evil King Alteon the Imbalanced threatens to destroy everything with the crushing force of his undead army. Crossing over to the Mirror Realm (or them coming here) takes an enormous amount of power and whatever crosses has to trade places with its reflection, unless you come from OUTSIDE the Multiverse (like Paul & Storm, the interdimensional bards) or you are you. You are very special. For an unknown reason there is no reflection of you so crossing over takes much less energy. Unfortunately this has tipped the scales of dimensional balance and as you have grown in power, the imbalance has become greater and greater. In such cases the multiverse can heal itself by removing the problem and erasing you from ever having existed in space-time. Your good friend, Drakath (the one from the other side) has not forgotten what you did for him and his friends on your last visit and will stop at nothing to help you find some way to balance your existence in his universe... but what could possibly balance out the vast effects that you've had in your own reality? It's Missing Left Sock Day! Will YOU find one? For some reason, I can NEVER find my socks! (That may be because I don't own any.) From what I hear, lots of you guys have the same problem, and you DO own socks! Last year, to raise awareness about this missing sock epidemic, Cysero opened the Missing Left Sock Day shop and wrote a moving speech. Read about the nature of this sock-ing mystery here: Cysero's Sock Public Service Announcement. Sadly, the problem still exists. For the last month, we've had players on Twitter calling our attention to the fact that they can't find their socks anywhere! Not in their drawers, not on their floors. Not under their beds, not on top of their heads. So today, May 9th, Missing Left Sock Day 2013, we want to gather everyone in AQWorlds and FIND THOSE SOCKS! Find the Socks, Get the Prizes! Everyone loves socks! (Unless you've got sensitive feet...) So we've crafted some woolly gear that'll really sock it to ya! Finding the Sock Shop will be quite a feet! We can't just tell you! The whole point of the game is to find the socks and get the prizes! But I will give some you some hints. Not in a Chaos Beast map. Not always in the first room of a map. May be draped on, over, or around NPCs. Replace your weapons of steel and iron! Man your battle-stations with the latest cutting-edge gear from our Irony X3 Limited Time Shop** and victory will be yours! Remember: in a fantasy game, it's always a good idea to bring a Blaster Beam to a blade fight, so become the Iron Warrior you never expected to be! * Ok, wrong franchise, but it sounds so good! Irony X3: Become an Iron Warrior! *** Irony is when what you expect (here, a science-powered armor) is different from what actually IS (the Irony Man gear being powered by magic). Tomorrow: Missing Left Sock Day! Get ready for a SOCK HUNT! Starting tomorrow, you'll need to hunt through the game to find socks. They may be on trees, they may be on rocks. They may be on hills, they may be on crops. Once you find them, click on the sock to open the FOUND Sock shop! We don't know WHERE the Middle Sock came from. NEW Cinco de Mayo Weapons! Maracas of DOOM +15! Break some skulls and SHAKE your way to victory! Grab the new Maracas of DOOM +15 from the Cinco de Mayo 2013 shop, because they do 15% more damage against undead! 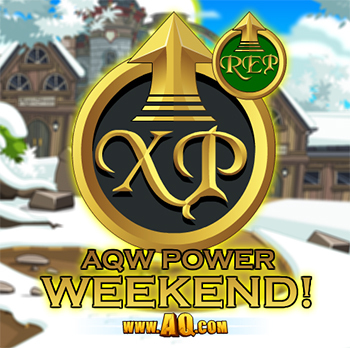 Fiesta in AQWorlds this weekend! You'll find the Cinco de Mayo shop in your Dragon Menu, and it's packed fuller than the pinata pet with equips for the whole party, Guild, or clan of worthy warriors! Maracas and Dos Maracas weapons! Sombrero and Big Sombrero helms! Well, technically, in the Artist Showcase Shop. It’s Tuesday! And you know what that means: an all-new limited time Artist Showcase Shop in Battleon! This week is dedicated to Hizu, our very own volunteer animator for AQW. 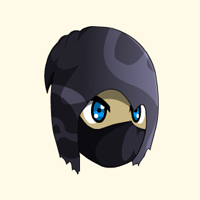 Hizu has a hoard of Ninja-themed items that will make you stand out of a crowd rather than blend in! Shinobi Senshi Armor – Rare! Kaze Cape of Shinobi – Rare! 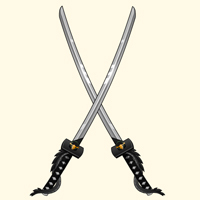 Dual Doragon Katanas – Rare! When you look THAT good, you WANT be seen. Just make sure to buff your Stealth Stats if you wish to pursue the way of the Ninja. 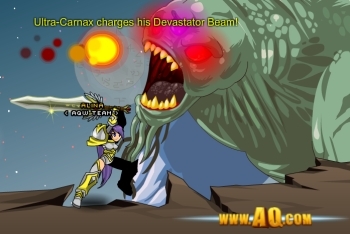 Ever wonder how AQW Monsters learn their attacks? Hizu teaches them! Every week when Hizu isn’t slaying pirates and robots and robo-pirates, that Ninja sneaks into Lore’s monster training camp and animates Monsters with vicious attacks. He’s been hard at work since June 2011—and now you know why those Monsters are so dang difficult! Grrrr!! Hizu wanted to be an animator/monster attack trainer ever since he feasted his eye* on Samurai Champloo back in 2005. Hizu always wanted to create something that others could see and enjoy, and thus began his vigorous animation conditioning. Hizu’s favorite thing about Artix Entertainment is how accessible our games are for newcomers but insanely deep with thousands of years of lore to tell an endless story. *Hizu only has one eye! Perhaps he dodged a Ninja Star a second too late? Every Tuesday**, AQWorlds releases a limited-time Featured Artist Showcase Shop loaded with items that an Artix Entertainment artist creates. Using his or her own style and flair, our wonderful artists create truly amazing Armors, Weapons, Helms, and other Items just for you! But these items are only available for 1 week, replaced the following week by another artist’s items. **Quibble got a brand-new shipment of items last Tuesday and wanted to showcase his stuff instead! We’ve known that traveling sales Moglin for a long time, so we gave him dibs. 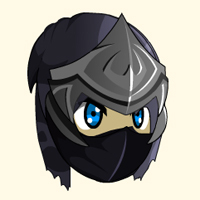 Get your Ninja on in Battleon’s Artist Showcase Shop!